Thank you. It’s a pleasure to be in such a historic place with so many historic and soon-to-be-historic people. I am honored to stand before you today to accept the award of Student Laureate on behalf of the 2016-2017 cohort. I extend hearty congratulations to my fellow Laureates on the work that has brought them here today: I am honored to be counted among such an accomplished group of young people. We gather here to affirm civic engagement, public service, and dedication to the pursuit of the common good. These values have long been esteemed in this country and in this state and our recognition today represents not merely a celebration of a job well done, but an acknowledgment of the imperative to continue in the cause. To my fellow Laureates, I would say this: our work is cut out for us. As a cohort and as a generation, we will face challenges of ever-new and different kinds that will to call on us to embody to the best of our ability the values that we affirm here today. I encourage and implore you all to continue use your considerable intellects and capacity for action to effect change in the world around you. There is much to learn and there is much to be done. Before closing, I would like to take a moment to recognize family, friends, and mentors who are here today; we would not be here without your support and thank you for it. In addition, I would like to extend a sincere thank you on behalf of the cohort to the Order of Lincoln for the honor of this award; to be recognized alongside such distinguished public servants is a privilege and an inspiration, and we hope to do you proud. Thank you again, and to my fellow Laureates: another well-deserved congratulations. 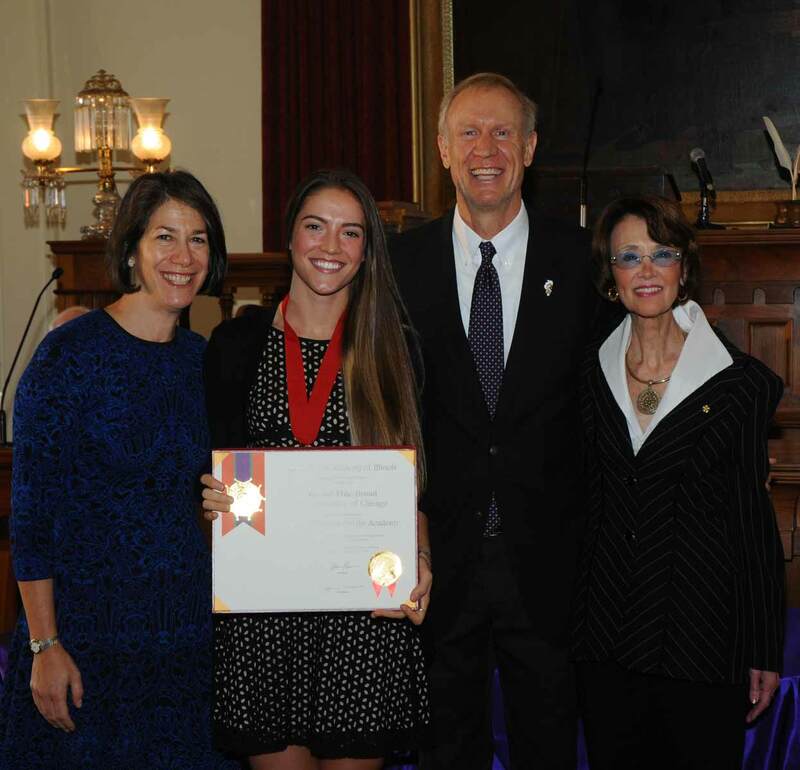 Rachel receiving her award from Governor and Mrs. Rauner and Chancellor Marshall (on right). 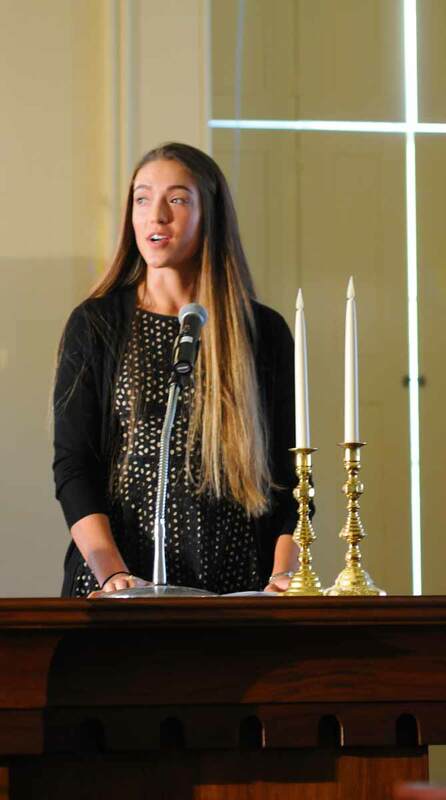 Rachel Hile-Broad’s speech can be viewed on the Student Convocation Video, 2016 page. Her introduction by Dr. Stephanie Pace Marshall, Chancellor of The Lincoln Academy of Illinois begins at 14:55. Rachel’s speech begins at 16:07 and concludes at 17:54.